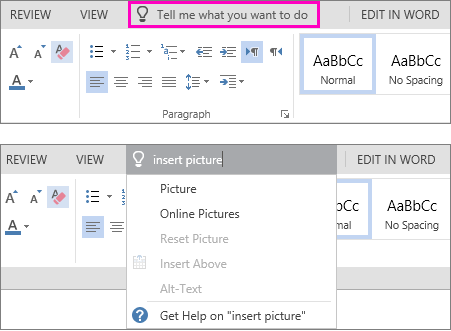 You'll notice a text box on the ribbon in Office 2016 and Office 365 apps that says Tell me what you want to do. This is a text field where you can enter words and phrases about what you want to do next and quickly get to features you want to use or actions you want to perform. You can also use Tell Me to find help about what you're looking for, or to use Smart Lookup to research or define the term you entered. 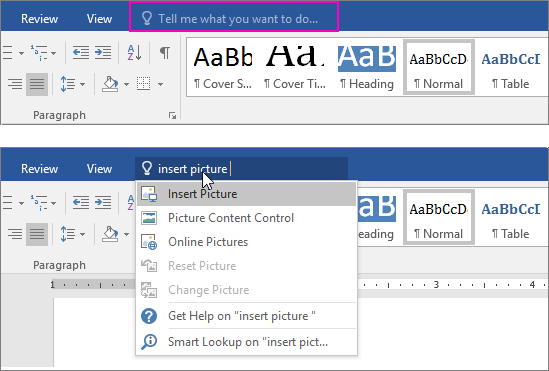 Note: At Microsoft we're continually testing out new things to help you achieve more with Office. To that end some customers may see Search instead of Tell me what you want to do in the ribbon. The functionality is identical, we're just trying out some new ideas to make it more discoverable for you. 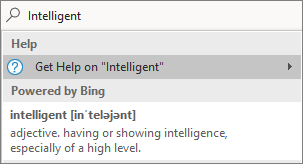 If you're an Office 365 subscriber, you've opted into Intelligent Services, and you're connected to the Internet you can type any word into the Tell Me search box and Bing will try to get you a definition of that word. 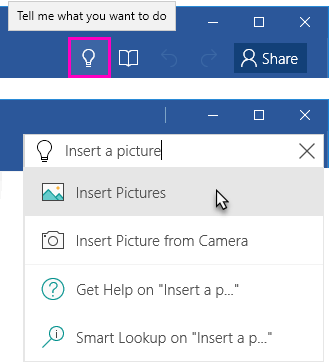 If you're using an Office 365 subscription in your business, and are currently connected to the Internet, you can type the name of anybody in your organization into the Tell Me search box and we'll try to find their contact information in the directory. Hover over their name and you'll see their contact card as well as being able to share the current file with them. If you're using an Office 365 subscription in your business, and are currently connected to the Internet, you can type the name of any file you have stored in OneDrive or SharePoint. 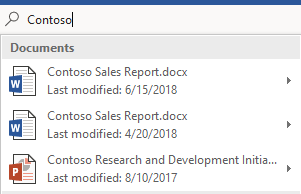 Hover over the name of the file and you can insert the item into your current file, or open it separately in the appropriate application, such as Word or Excel. 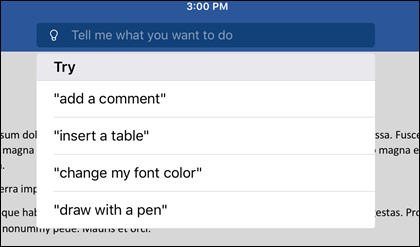 Tell me is a text field where you can enter words and phrases about what you want to do next, and quickly get to features you want to use or actions you want to perform. 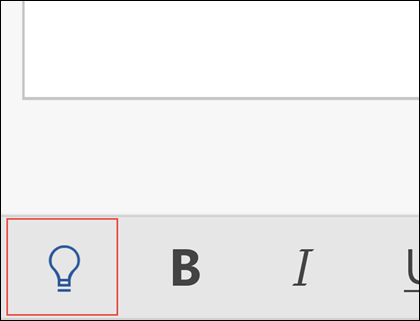 When you're editing a file in Office for Mac you can access Tell me by clicking the light bulb to the right of the tabs, and entering your query, as seen in the image below. Tell me is a tool where you can enter words and phrases about what you want to do next, and quickly get to features you want to use or actions you want to perform. 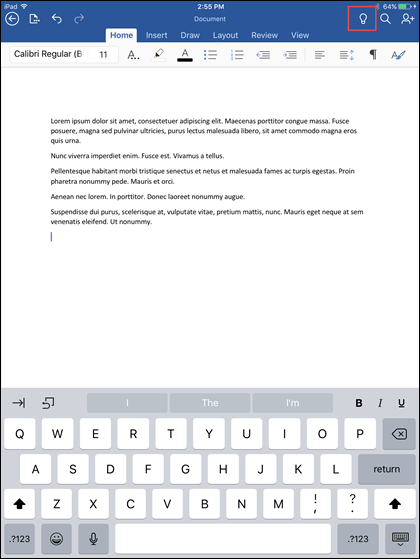 Tell me is a text field where you can enter words and phrases about what you want to do next, and quickly get to features you want to use or actions you want to perform. You can also use Tell Me to find help about what you're looking for, or to use Smart Lookup to research or define the term you entered. This article was last updated by Ben on June 26th, 2018 as a result of your comments. If you found it helpful, and especially if you didn't, use the feedback controls below to let us know how we can make it better.